Many crafts have been carried out in Verwood, some as indigenous industries while others have been carried out by Enthusiastic residents. Brickworks began operating in Verwood in the 1840s. One at Ebblake, on the Hampshire-Dorset border, produced white and red bricks and drain pipes from clay dug on the site. This brickyard closed about 1908 to 1909 as apparently the seam of clay had been completely dug. The Gotham brick and tile yard was situated in Romford on the western edge of Verwood. The Kilns and Chimney were demolished in the 1970's. Note:- that some Besom making still continues. In 1968, quite by chance, it was discovered that a village resident, Mrs. Horwood, is not only a keen needle woman and an authority on Dorset Feather Stitchery, but was doing her utmost to revive buttony and lace-making. There were four forges in Verwood in the early 1900s, three of these combined smithing with the work of the wheelwright. The Ringwood Road forge was working again in 1967 and had been in use for at least one hundred and fifty years. This page from 1998 discusses Mr. Kerley is another Verwood craftsman continuing in his father's footsteps and describes the making of hurdles. Hurdle making, Besom making and Pole Lathe Turning demonstrations are often held on Ferrett Green in front of the Heathland Heritage Centre, usually with Mr Don Taylor, Mr Terry Heard and Mr Chris Albray. 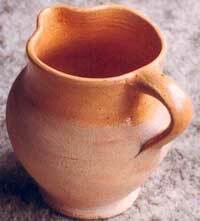 The last remaining Verwood pottery finished producing pots in 1952 for economic reasons. 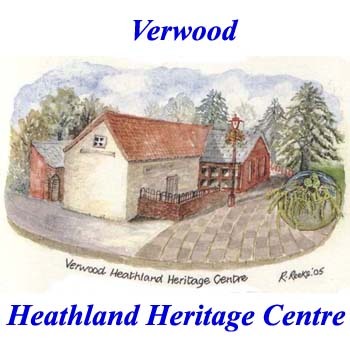 This, the Cross Roads Pottery had now become the site of the Verwood Heathland Heritage Centre. There is no evidence of weaving as a main occupation in Verwood but in 1968 Miss W. who wishes to remain anonymous, moved to Verwood in 1947. She had previously lived and worked in London. In the early 1960's After Mr. Sims had retired, the "Village Smithy" stayed empty for five or six years, until Mr. Smith re-opened it in a completely different sphere, wrought-iron work. There were some crafts that have left no visible evidence other than a mere mention in records of the area. In the thirteenth century tanners were in abundance in the Cranborne Chase, the deer hides being exported to Normandy .